The launch of the Journal of Strategic Contracting & Negotiation is a momentous event for anyone who cares about the field of contracting. For the first time, there is a dedicated academic journal that will promote and consolidate research in this area. Since its launch in 1999, IACCM has been able to point to a series of important milestones. Among these, the introduction of a core ‘body of knowledge’ and the success of professional certification are two obvious examples. Without these, there can never be ‘a profession’ – instead, those performing contracts or commercial roles would remain isolated groups or individuals with no evident career path or status. The Academic Journal takes us to a new level because it reflects a belief in academia that our field is important and that it merits dedicated research. It offers a realistic hope of wider availability of degree-level programs, adding to the handful that already exist. Such a development also raises the profile and respectability of our work, since it means through research we can demonstrate the impact of contracting on business outcomes. The first edition of JSCAN is available now, at no charge. 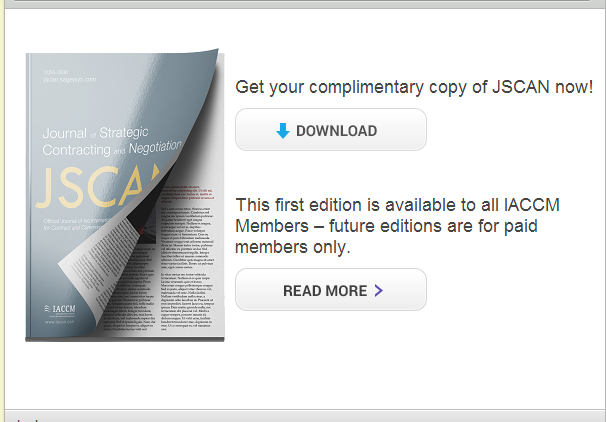 Future editions will be free to IACCM members – yielding a large global circulation from inception.